After cooling off with some S’mores Fudge Pops, celebrating National Cheesecake Day with my Strawberry Lime Cheesecake Bars and enjoying a slice or two of my Glazed Peach Bread each morning. 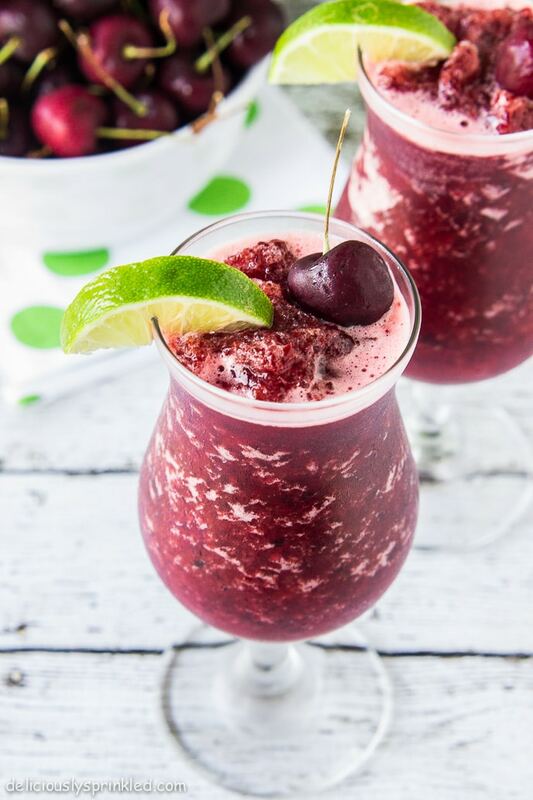 I decided I would make these Skinny Cherry Limeade Slushies before I go into a sugar coma! 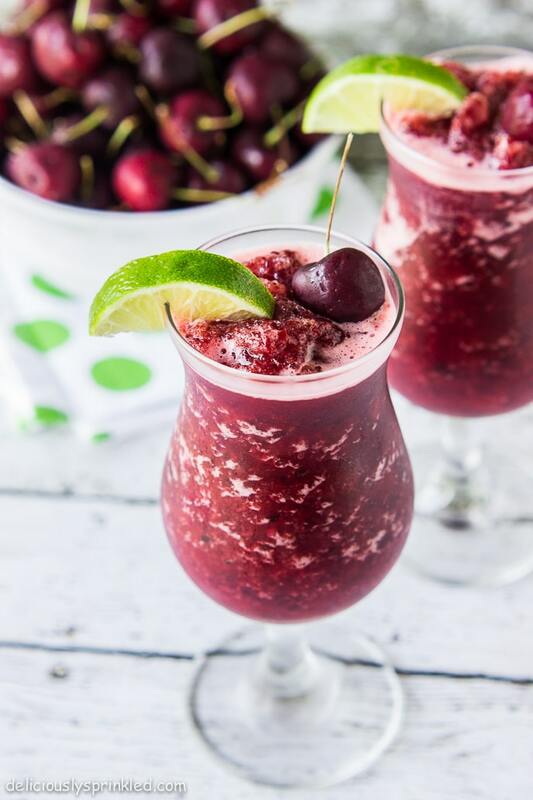 These slushies are super simple to make, all you need is cold water, Sweet’N Low, fresh lime juice, ice, and frozen cherries. Blend it all together and you will have yourself a refreshing, zero calorie and guilt-free drink. 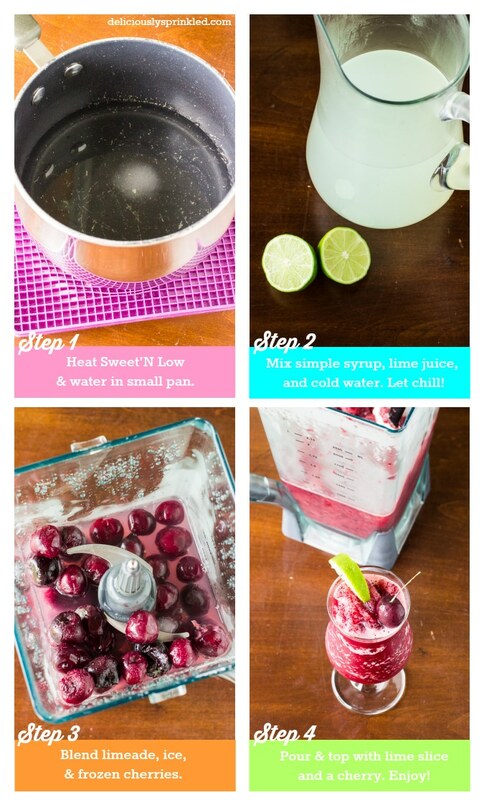 Add a slice of lime and a cherry on top of these slushies to dress them up. Now all you need is one of those cute drink umbrellas and this drink will make you feel like your on vacation. Enjoy! First, make the limeade: Combine the Sweet'NLow and 1 cup of water in a small saucepan to make a simple syrup. Cook over medium heat until the sugar has dissolved. Let cool. In a pitcher, combine the simple syrup, lime juice, and cold water. Let chill in refrigerator for about 15 minutes before making the slushies. 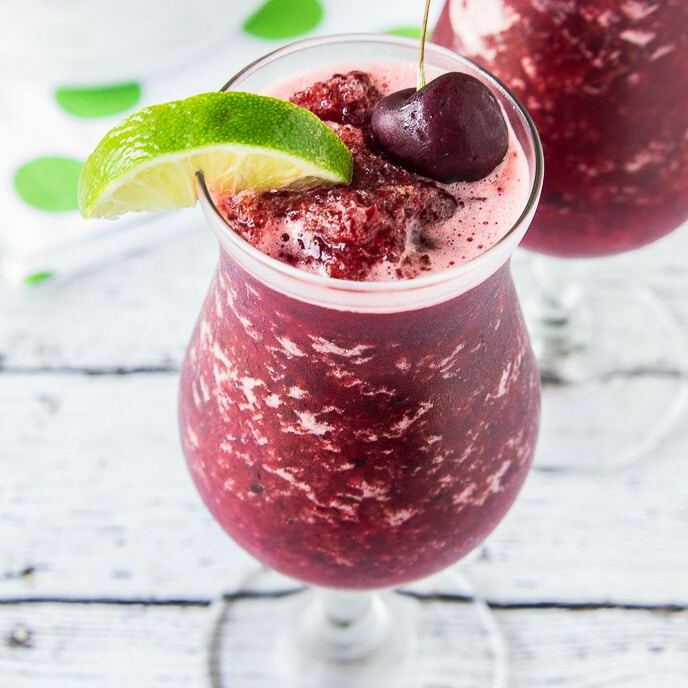 Combine 2 cups limeade, ice, and frozen cherries in a blender. Start with 1 cup crushed ice and add additional ice until desired slushy-ness is achieved. Puree until blended to slushy consistency. Pour into tall glasses and garnish with a lime slice and a cherry, serve immediately and enjoy! 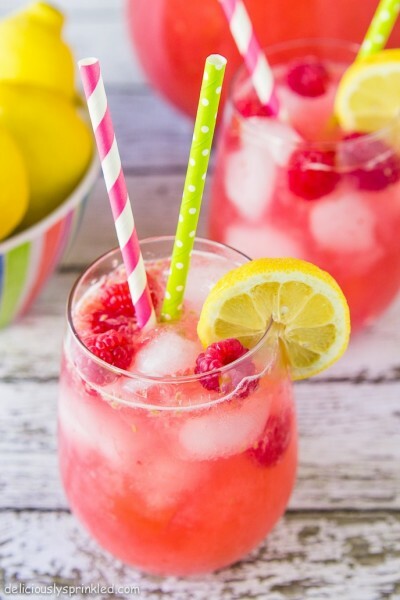 Next try this delicious Raspberry Lemonade! Well, hello there delicious slushie. This looks so refreshing and fruity. Since I’m all about the cherries this summer, this is going to happen. Pinned. Such a fun and pretty drink for those hot summer days! These look so refreshing! I have a bunch of cherries in my fridge to use up! These look perfect for a hot summer day! Love how easy they are to make too! Can’t wait to try them out 🙂 I usually end up in a sugar coma too..these seem like a wonderful break! That looks so refreshing! What a great way to cool off. Yes, yes, YES! They look amazing Jenn! Love those flavors. Lovely! I love real cherry flavor in drinks. So delicious! Oh these look marvelous to cool off with on a hot day! Gorgeous photos as always! This looks like the perfect summer drink! Lets hope your dad isn’t reading this post! Love the recipe! Eek! Sonic cherry limeades are my go-to in the summer time, loveeeeeee these homemade babies! This slushie looks absolutely incredible, so perfect for summer!